If you’ve never had a chance to play Ticket to Ride (TtR), a titan of the board game world, then you’re missing out. It’s a wonderful game about building train routes across the United States in the early 1900s. If this sounds dry, it’s anything but. There’s a reason why Ticket to Ride has sold millions of copies. It features exquisitely detailed artwork, bright colorful pieces, and clever gameplay. Days of Wonder have come out with stand alone versions set in Europe and Germany, expansion boards set in India, Africa, Asia and the state of Pennsylvania. There’s even a version featuring boats! 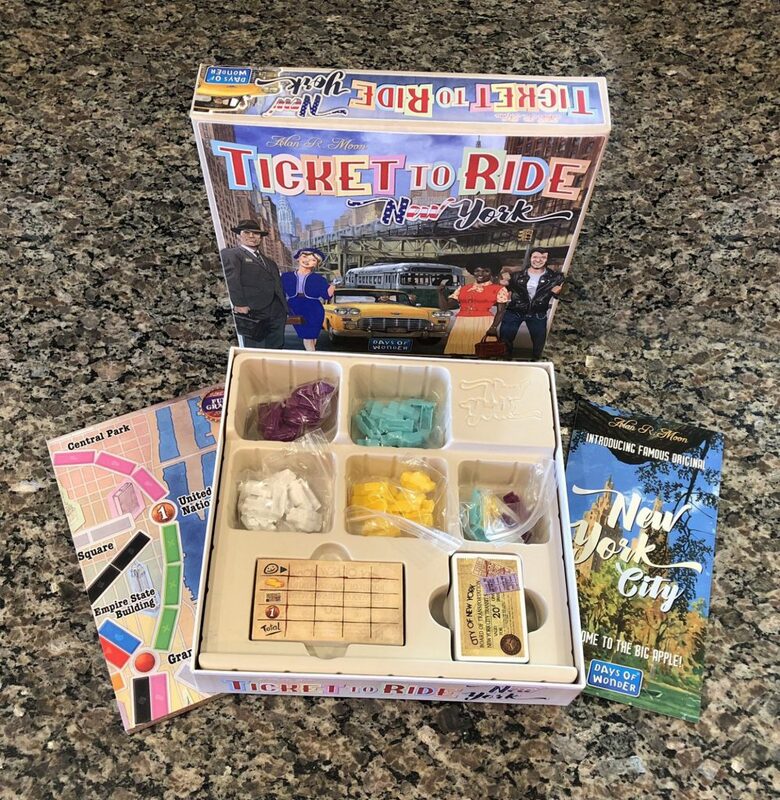 With this most recent Target exclusive stand alone game, Days of Wonder is ratcheting down the scale and ramping up the fun, plopping players down in the heart of Manhattan in the 1950s. 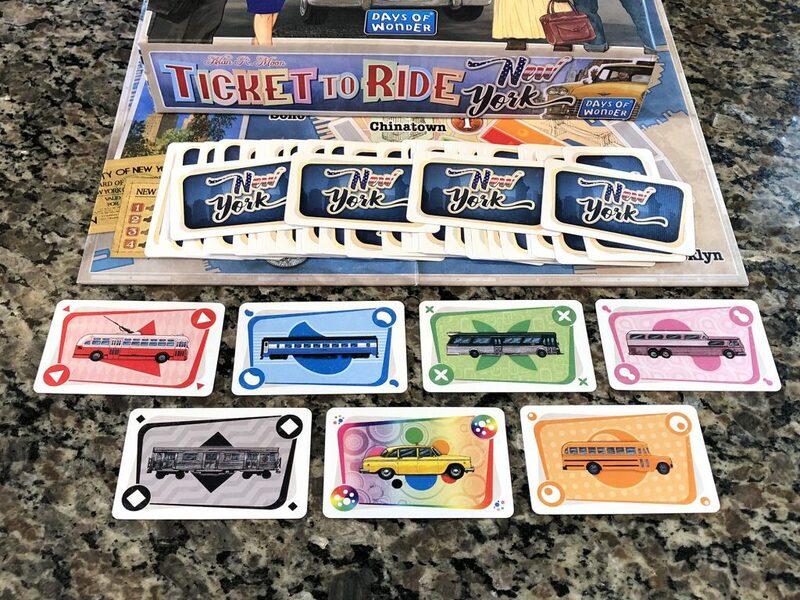 If you’d just like to read what I thought about Ticket to Ride: New York, feel free to jump to the bottom. If you’d like to find out how the game is played, or what differences New York has from other TtR games then keep on reading. The longest route is 4 spaces (Chelsea to Soho) which means the maximum route score is 7 points. Players draw Destination Ticket cards which feature two points in Manhattan. They must then connect those two routes by drawing and using appropriately colored Transportation cards from a shared display. After playing the correct number and color of Transportation cards, players place their colored taxi markers on the matching colored route. To place taxis on the green route, any combination of green cards or wild cards can be played. 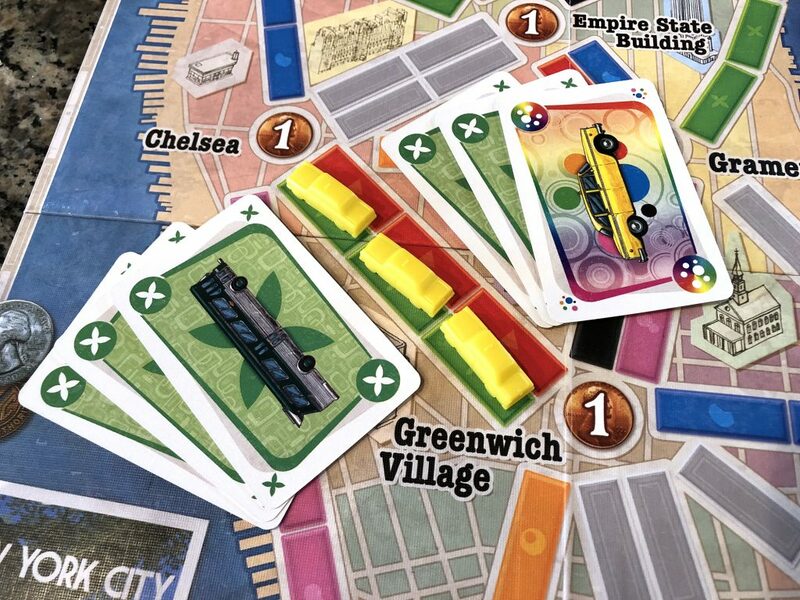 That’s right, even though Ticket to Ride is a “train game”, in New York taxis take center stage. 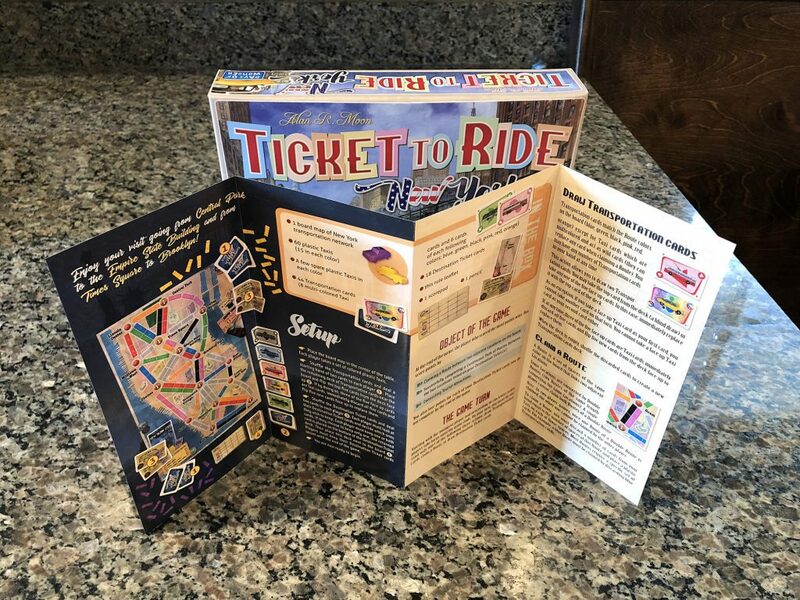 Play continues around the table; drawing Destination Ticket cards when necessary, drawing and playing Transportation cards to match your Destination cards, and placing your taxis on the board. When one player has fewer than three pieces remaining, the game end is triggered and each player gets one last turn. Unlike other Ticket to Ride games, in Ticket to Ride: New York scoring only happens at the end of the game. Players receive points for each completed segment on the board, each completed Destination Ticket, and every Tourist Attraction they’ve connected to. Players then subtract points for each incomplete Destination Ticket card. The player with the most points wins the game. The original Ticket to Ride is such a good game, and Days of Wonder has been continually building upon that framework over the past decade: adding new features, expansion content, and stand alone games like a sculptor slowly creating a face from raw clay. But in New York they’ve chosen to trim away the excess and pare down Ticket to Ride to its most base concept: route efficiency and point maximization. Because there are fewer points on the map and fewer pieces the game plays more rapidly, but that reduction in time adds tension. 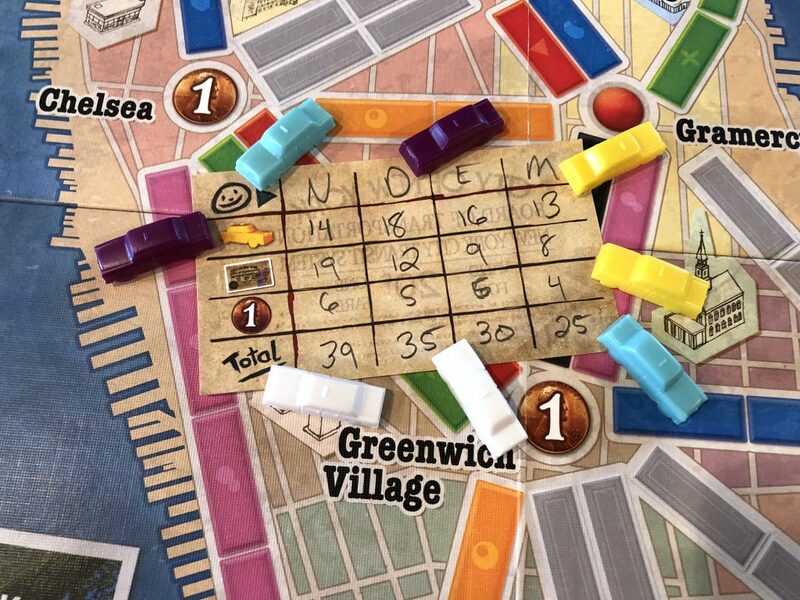 There’s little time to develop a strategy because your opponent might grab the single length segment between the Empire State Building and Gramercy Park forcing you to expend 4 of your 15 taxis to detour through Chelsea and Greenwich Village. Days of Wonder have ripped out the lengthy routes and longest train bonuses. They’ve trimmed down the footprint by providing fewer taxis, removing the scoring track from around the edge of the board, and reducing the board size dramatically. They’ve even excised an entire player (lowering the max player count from 5 to 4). All of this results in a game which fits in a box smaller than a sheet of paper. A delightful addition to the game is the design of the rulebook which looks like a traditional pamphlet; a nice touch. 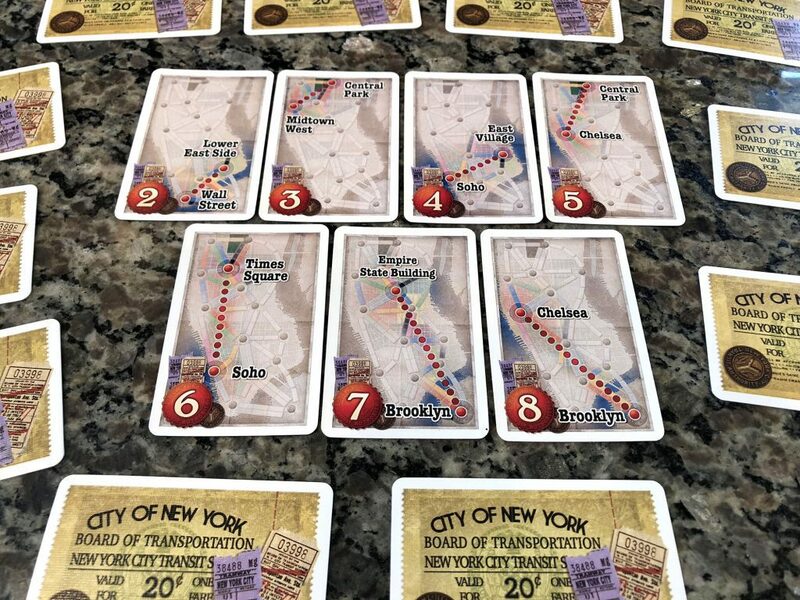 Ticket to Ride: New York is not without flaws. Because it’s over so fast, point totals can be pretty low. In my first game I actually thought I might wind up with negative points because I tried to speed through the board to complete Destination Tickets. By doing so I completed only short segments, but then wound up with 1 incomplete high point value Destination Ticket. It turns out my math was off, but it wouldn’t be inconceivable to have a score in the single digits if you played poorly or never got the cards you needed. You’re not likely to complete more than 3 or 4 tickets in a single game. Because the Destination Ticket cards have such low point values it can also be tough to catch up to a player who might have completed a high value route. Additionally because the max segment length is 4 it’s also tough to gain points on that front. 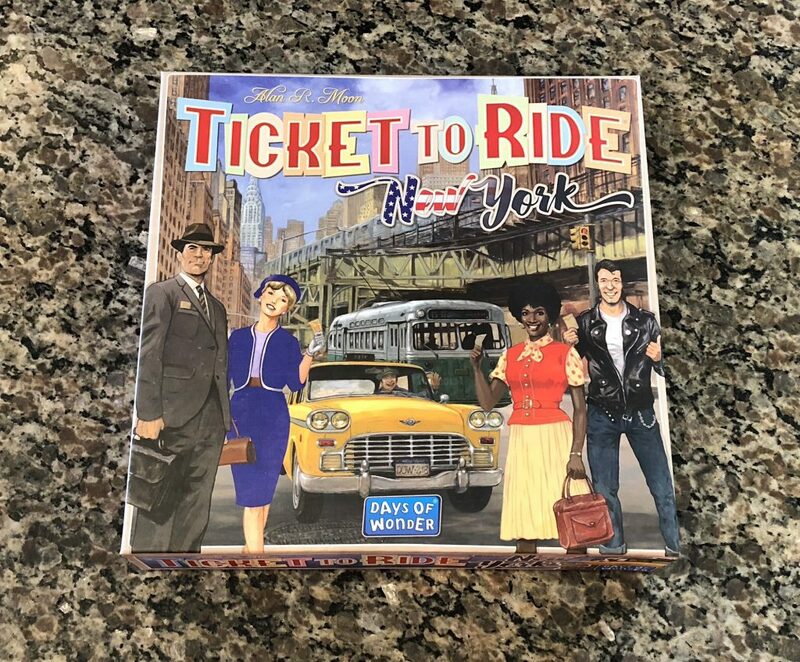 Players used to the pacing of longer versions of Ticket to Ride may be thrown off by the hectic rush of New York (laughably thematic given the setting). Groups used to playing with 5 may be disappointed at the lower player count. But, given the reduced time, you can play multiple games fairly quickly if more than 4 want to get a game in. In the 2 player games between my wife and I, it was almost over too fast. It’s possible that I was just projecting an expected time based on past experience with the base game. Usually a 3-4 player game might take around an hour or more. My wife isn’t into gaming to the same degree that I am, and will reluctantly play games on request. When we do sit down to play she has pretty specific requirements about what she’s willing to consider. She prefers games that are short, easy to learn, or ones she already knows. This means that Ticket to Ride: New York is perfect for us. The original has been a family favorite for over a decade and the advertised time for New York of 15 minutes is great for her. Going into our first game I was positive that there was no way the game would be over in 15 minutes, but it certainly was. In fact we played two games that first night in half an hour. With New York, Ticket to Ride proves yet again that it is one of the strongest brands in board gaming. This game is an excellent way to introduce your non-gaming friends to board gaming in a manner that’s fast, fun, and easy to teach. 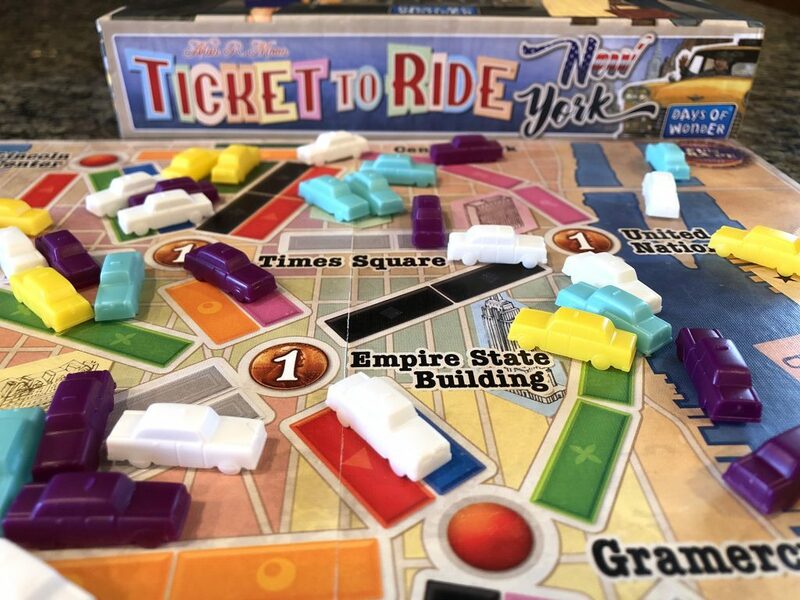 With a price point of just $19.99, and the ability to pick it up at your local Target store right now, there’s no reason NOT to have Ticket to Ride: New York in your collection. They wanted to do a modern day New York version of the game, but the NJ transit part of it kept breaking.